NOTES: Is this a weird kit or what!? TheSoviets were looking for a way to move a lot of men and materiel quickly overwater and other semi-smooth terrain. What they came up with was a very largeground effects vehicle the 'flew' a few feet above the surface. The benefit ofthis type of transportation is that it is fast (around 500kph), 'flies'under most enemy radar, can carry a lot of cargo/troops, is much more fuelefficient than an aircraft, and can also travel some distance over land if thereare no real obstacles. The prototype Ekranoplan M-1 was firstdiscovered by US spy satellites enveloped in a cloud of spray while undergoingtrials on the Caspian Sea in the early 1970s. It was a much smaller (100 meterslong) technology demonstrator. It was envisioned that 120 of them would bebuilt, but in effect only four were built, one of which was a static testairframe. Of the other three, one was lost in an accident in Sept 1992 and theother two were used operationally until October 1993. What killed the projectwas the dissolution of the Soviet Union and the inability of any of the newstates to handle a large budget item like the Ekranoplan. First off, it is very gratifying to see that a major kit makerhas the foresight to produce a kit like this. Revell of Germany has been a verysurprising company and has given us as modelers a surprising array ofinteresting subjects over the last five years or so. I would never have dreamedthat this kit would ever have been made and it was with much anticipation that Iawaited its coming to the US after hearing of its release in Europe. Once theyhit the shelves, I immediately bought one (at retail price yet!). Frankly, thesekinds of kits draw me like a magnet!! It seems like Revell likes to spreadaround the molding of kits as this one is made in Denmark! Not exactly a placewell-known for producing model kits. What you do get is very typical ofRevell-Germany's more recent kits. It is molded in medium grey plastic (whichhas a sort of pebbly surface to it), and has the required engraved panel lines.There are no gimmicks to the kit and the only moving parts are the gun turretsand prop blades. One thing that is missing is a display stand. I would thinkthat a kit like this with no landing gear would warrant this now rare kitcomponent. Anyway, the parts are well molded and crisply done. There is someflash on a few bits as well as a few sink marks, these being mostly oppositealignment pins and are found on the fuselage, horizontal stabilizer and gunturrets. Care has been taken to engineer the kit so that mold release pinmarkings are either not at all present or are on sections of a part that willnot be seen once the kit is built. 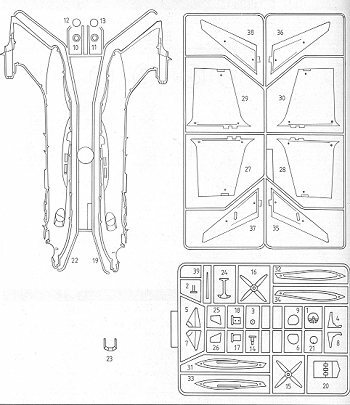 I have been unable to show all the parts of the kit as they aretoo large for my scanner, but have shown the fuselage, a closeup of the nose andthe parts diagram from the instructions to give you an idea of what the 41 partslook like. There is one clear bit for the cockpit and no interior detailing atall as usually befits kits of this scale. Instructions aretypical Revell AG in that they are on newsprint quality paper, have many pagesof warnings, and the usual drawings for the 23 construction and decaling steps.Colors given are generic names with Revell AG paint codes. Three of the colorscalled out must be mixed, which includes the overall color of the kit. The decal sheet is very nicely done andis in register. It is printed in Italy so will be of better quality than thosethat are usually found in Revell AG kits. They are semi-glossy and should workvery well indeed. There are two subjects on the sheet. Both from Kasplisk navalbase on the Caspian Sea in Dagestan, Russia. The one with the large eagle (whichI am sure is what most will build) is of the Soviet version while the other oneis the Russian version. I have heard that this kit does not buildwell, however, one really never knows until one tries. It looks great on thesprues and with a minimal number of parts should be a relatively fast build. Itwill certainly bring comments wherever it is shown and is the kind ofinteresting and unusual subject that should sell very well.